Built new for the Union Pacific (UP) as Postal Storage/Baggage car #5726, renumbered UP #904253 for use as MOW service. Acquired from Sims Metals by Golden State Model RR Museum for display at PT. Richmond. 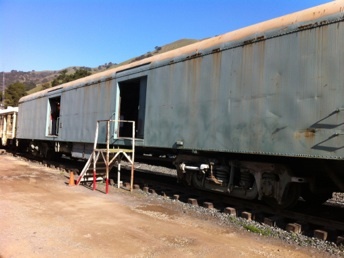 Donated in 2003 to PLA by Richmond Pacific who was storing car when GSMRM discovered it would not fit in location. Moved to Niles Canyon in big move of June 8, 2005. In use at Brightside.